one of my friends is opening a bakery called Cake and Loaf and they asked me to design and make the aprons for them! so far i have made a sample out of scrap fabric to see if they like the shape...i'll show you once i photograph it properly. this was my first attempt at altering a pattern and it went really well! i really want to make myself some dresses (i have a design in mind that i haven't found in stores) so i might try that next. i haven't been sewing much lately but i'm really excited to get back into it! has anyone ever made their own pattern? how did it go? i will keep you updated on my pattern making adventures. I took a sewing class some years ago, I made my own pattern for a skirt, I sincerely hate making patterns hahaha, sadly its the only way we can get what we have on our minds and make it from scratch, good luck on your journey! I'd also want to learn how to sew my own clothes. That would be incredible! It sounds like so much fun creating aprons! I took a pattern class in college. I found it difficult because I have a hard time seeing flat things three dimensionally. I felt it used the wrong part of my brain, the part that you use to do geometry and graphic design. Things I just can't do. I say give pattern making a try! You will be so happy knowing you made something completely from scratch! Pattern Drafting was hands down my least favorite class in college. I loathed it. Mainly because just one slight misread and your entire garment is off by like 4 or 5 inches. It was always the back measurements that got me! So frustrating! But I'm excited to see what you come up with! that is super exciting! i made a apron once and i love it!! it was actually my first sewing class!! Oh, fun! :) I haven't sewn an actual garment since *highschool*, I think - but I used to make/alter pattens like crazy! 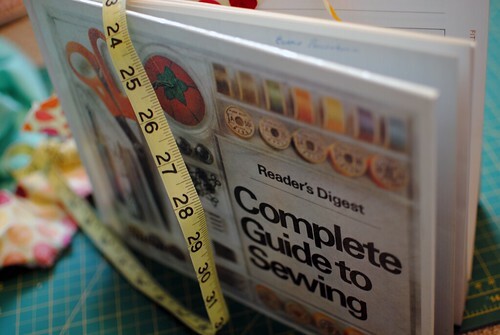 I'm craving some sewing, too, right now - I found some lovely vintage dress patterns and am going to pick up some fabric tomorrow! Eeek! :) Have fun! I've made my own patterns for plushies. They were only a few pieces, but kind of tricky at times. I always make small versions first so I don't waste too much paper. I've made my own patterns before..not only in sewing, but also in crocheting and knitting.